The first part of our tutorial focuses of formatting dates in Excel and explains how to set the default date and time formats, how to change date format in Excel, how to create custom date formatting, and convert your dates to another locale. Along with numbers, dates and times are the most common data types people use in Excel. However, they may be quite confusing to work with, firstly, because the same date can be displayed in Excel in a variety of ways, and secondly, because Excel always internally stores dates in the same format regardless of how you have formatted a date in a given cell. Excel stores dates as sequential numbers and it is only a cell's formatting that causes a number to be displayed as a date, time, or date and time. All dates are stored as integers representing the number of days since January 1, 1900, which is stored as number 1, to December 31, 9999 stored as 2958465. Times are stored in Excel as decimals, between .0 and .99999, that represent a proportion of the day where .0 is 00:00:00 and .99999 is 23:59:59. Excel stores dates and times as decimal numbers comprised of an integer representing the date and a decimal portion representing the time. If you want to know what serial number represents a certain date or time displayed in a cell, you can do this in two ways. 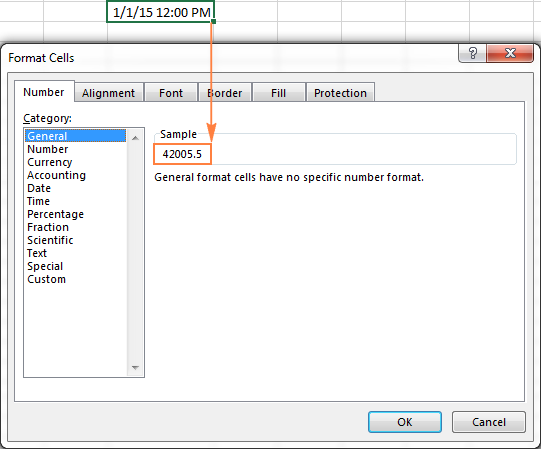 Select the cell with a date in Excel, press Ctrl+1 to open the Format Cells window and switch to the General tab. If you just want to know the serial number behind the date, without actually converting date to number, write down the number you see under Sample and click Cancel to close the window. If you want to replace the date with the number in a cell, click OK.
Use the DATEVALUE() function to convert an Excel date to a serial number, for example =DATEVALUE("1/1/2015"). Use the TIMEVALUE() function to get the decimal number representing the time, for example =TIMEVALUE("6:30 AM"). Note. Since Excel's serial numbers begins on January 1, 1900 and negative numbers aren't recognized, dates prior to the year 1900 are not supported in Excel. If you enter such a date in a sheet, say 12/31/1899, it will be a text value rather than a date, meaning that you cannot perform usual date arithmetic on early dates. To make sure, you can type the formula =DATEVALUE("12/31/1899") in some cell, and you will get an anticipated result - the #VALUE! error. If you are dealing with date and time values and you'd like to convert time to decimal number, please check out the formulas described in this tutorial: How to convert time to decimal number in Excel. The default date and time formats in the Format Cell box change as soon as you change the date and time settings in Control Panel, which leads us right to the next section. 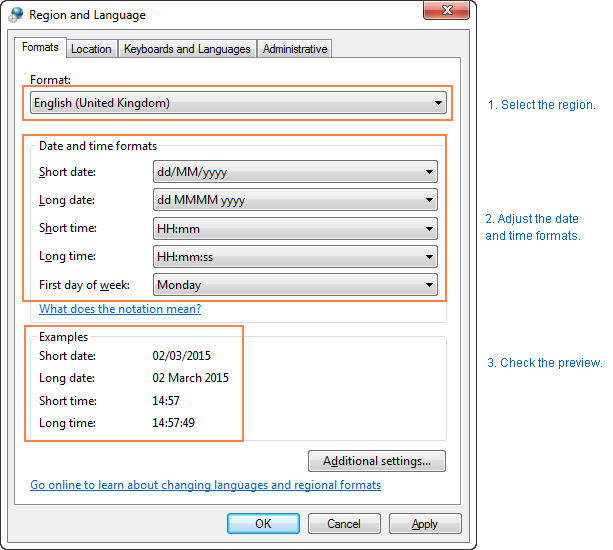 If you want to set a different default date and/or time formats on your computer, for example change the USA date format to the UK style, go to Control panel and click Region and Language. If in your Control panel opens in Category view, then click Clock, Language, and Region > Region and Language > Change the date, time, or number format. Tip. 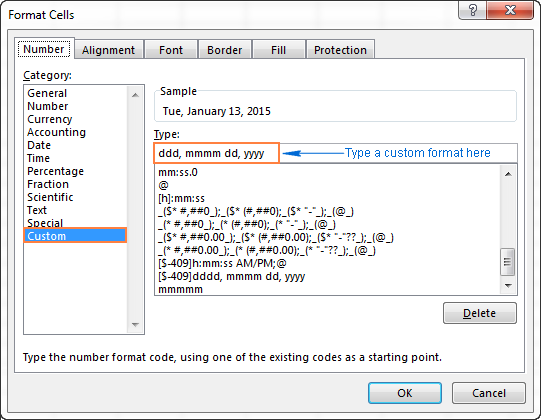 If you are not sure what different codes (such as mmm, ddd, yyy) mean, click the "What does the notation mean" link under the Date and time formats section, or check the Custom Excel date formats in this tutorial. If you are not happy with any time and date format available on the Formats tab, click the Additional settings button in the lower right-hand side of the Region and Language dialog window. This will open the Customize dialog, where you switch to the Date tab and enter a custom short or/and long date format in the corresponding box. Microsoft Excel has two default formats for dates and time - short and long, as explained in default Excel date format. Select the dates you want to format. On the Home tab, in the Number group, click the little arrow next to the Number Format box, and select the desired format - short date, long date or time. If you want more date formatting options, either select More Number Formats from the drop-down list or click the Dialog Box Launcher next to Number. 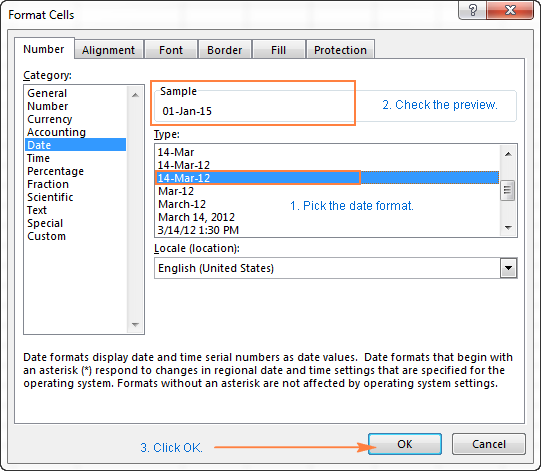 This will open a familiar Format Cells dialog and you can change date format there. Tip. 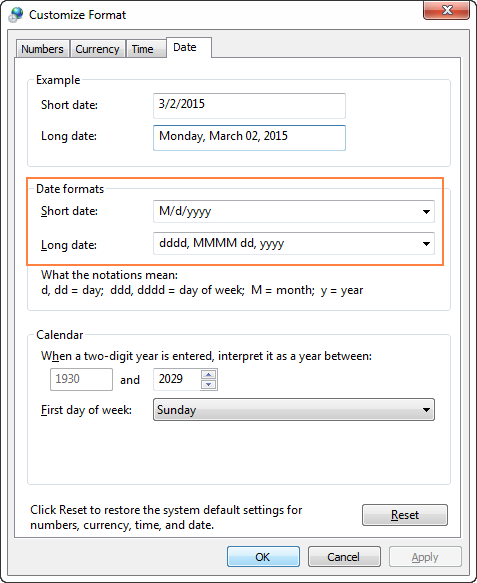 If you want to quickly set date format in Excel to dd-mmm-yy, press Ctrl+Shift+#. Just keep in mind that this shortcut always applies the dd-mmm-yy format, like 01-Jan-15, regardless of your Windows Region settings. In Microsoft Excel, dates can be displayed in a variety of ways. When it comes to changing date format of a given cell or range of cells, the easiest way is to open the Format Cells dialog and choose one of the predefined formats. Select the dates whose format your want to change, or empty cells where you want to insert dates. Press Ctrl+1 to open the Format Cells dialog. Alternatively, you can right click the selected cells and choose Format Cells… from the context menu. 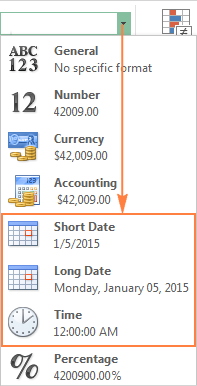 In the Format Cells window, switch to the Number tab, and select Date in the Category list. Under Type, pick a desired date format. Once you do this, the Sample box will display the format preview with the first date in your selected data. If you are happy for the preview, click the OK button to save the format change and close the window. If the date format is not changing in your Excel sheet, most likely your dates are formatted as text and you have to convert them to the date format first. Once you've got a file full of foreign dates and you would most likely want to change them to the date format used in your part of the world. Let's say, you want to convert an American date format (month/day/year) to a European style format (day/month/year). Select the column of dates you want to convert to another locale. Select the language you want under Locale (location) and click OK to save the change. If you want the dates to be displayed in another language, then you will have to create a custom date format with a locale code. If none of the predefined Excel date formats is suitable for you, you are free to create your own. In an Excel sheet, select the cells you want to format. On the Number tab, select Custom from the Category list and type the date format you want in the Type box. Tip. The easiest way to set a custom date format in Excel is to start from an existing format close to what you want. To do this, click Date in the Category list first, and select one of existing formats under Type. After that click Custom and make changes to the format displayed in the Type box. When setting up a custom date format in Excel, you can use the following codes. When setting up a custom time format in Excel, you can use the following codes. Note. If you're setting up a custom format that includes date and time values and you use "m" immediately after "hh" or "h" or immediately before "ss" or "s", Microsoft Excel will display minutes instead of the month. When creating a custom date format in Excel, you can use a comma (,) dash (-), slash (/), colon (:) and other characters. You can find the full list of locale codes on this blog. Usually, Microsoft Excel understands dates very well and you are unlikely to hit any roadblock when working with them. 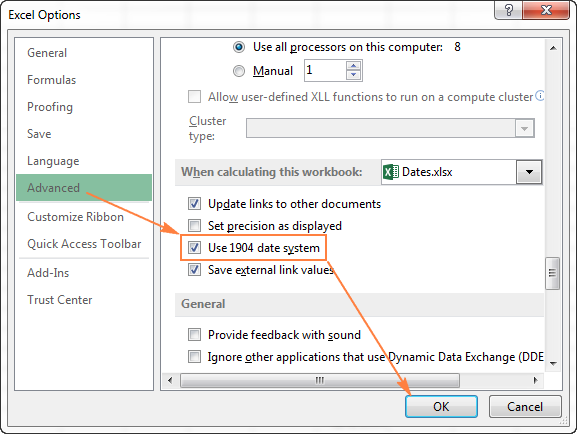 If you happen to have an Excel date format problem, please check out the following troubleshooting tips. If you see a number of pound signs (#####) instead of dates in your Excel worksheet, most likely your cells are not wide enough to fit the whole dates. Solution. Double-click the right border of the column to resize it to auto fit the dates. Alternatively, you can drag the right border to set the column width you want. In all modern versions of Excel 2013, 2010 and 2007, hash marks (#####) are also displayed when a cell formatted as a date or time contains a negative value. Usually it's a result returned by some formula, but it may also happen when you type a negative value into a cell and then format that cell as a date. Solution 1. Switch to the 1904 date system. Go to File > Options > Advanced, scroll down to the When calculating this workbook section, select the Use 1904 date system check box, and click OK. In this system, 0 is 1-Jan-1904; 1 is 2-Jan-1904; and -1 is displayed as a negative date -2-Jan-1904. Of course, such representation is very unusual and takes time to get used to, but this is the right way to go if you want to perform calculations with early dates. Solution 2. Use the Excel TEXT function. 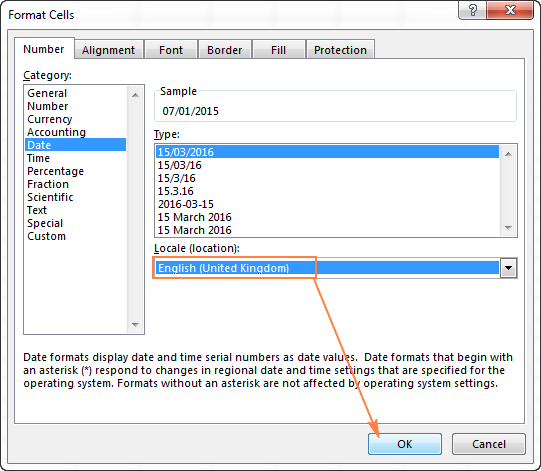 You may want to change the cell alignment to right justified, and naturally, you can use any other custom date formats in the TEXT formula. Note. Unlike the previous solution, the TEXT function returns a text value, that is why you won't be able to use the result in other calculations. When you are importing data to Excel from a .csv file or some other external database, dates are often imported as text values. They may look like normal dates to you, but Excel perceives them as text and treats accordingly. Solution. You can convert "text dates" to the date format using Excel's DATEVALUE function or Text to Columns feature. Please see the following article for full details: How to convert text to date in Excel. This is how you format dates in Excel. In the next part of our guide, we will discuss various ways of how you can insert dates and times in your Excel worksheets. Thank you for reading and see you next week! 353 Responses to "How to change date format in Excel and create custom formatting"
I think the easiest way to is to select the cells and use the Text-to-Columns tool in the data tab. Select the cell that holds the "November, 2016". Choose the Delimited button, click next. Choose the Other button and enter "," in the field, click next. Then you'll see how Excel will separate the data, click finish. You can select a destination cell if you need to. Keep in mind that the cell you select will be the first cell of two cells for the separated data. After this you will have the year separated in a destination cell as Date. Go through this same procedure for as many of the cells at one time as you want - one more or one hundred more. Sir, I have write a date format in excel i.e. 05.05.2016 but i want to change it automatically in 05/05/2016 with the formatting option, I have tried many times but nothing change, so please do the needful at the earliest. The easiest way to do this is to Find and Replace the "." with a "/". After you've done this Excel will recognize the entries as dates and then you can format them to be displayed in the format that suits you. Select the cells that hold the dates you want to change. The first time you do this you should click the Find Next button then the Replace button. This way you can see what the Find and Replace procedure is doing to your data. When you're satisfied that Find and Replace is doing what you want you can click the Replace All button. When this procedure id finished, you can select the newly modified cells and click the Format Cells option and format the entries to be display in the manner you like. I've got a cell formatted as date (dd mm yyyy), which is the system format. If I enter a date as 1/7/2018 or 01/07/2018, the cell displays 00 01 1900. Any other way of entering a date seems to give an error. I need to dates in date format in order to do some statistical analysis on the data as a time series. Any help would be appreciated. Have you tried to change the format for the cell? Right click on the cell, select Format Cells and then choose a date format that displays the data the way you want. You may need to try a custom format the option for this is at the bottom of that same format cells window. How would I auto-populate the lease end date in excel? I.e. lease start date: 10/01/2018 with a 48 month lease would end on 09/30/2022. I am trying to find a formula to quickly generate the end date based on the start date and the amount of months. How would I do that? There are three formulae you can use to accomplish what you want. One is =EDATE(A1,48) where the start date is in A1 and you want the date 48 months hence. The second is =DATE(YEAR(A1),MONTH(A1)+48,DAY(A1)) where the start date is in A1 and you want the date 48 months hence. Each of these will return 10/1/2022. All of these dates are correct, but you might want to use the last formula. how can i calculate the actual hh:mm:ss from past date & time to current in excel sheet. Please reply me its very urgent . I exported data in this format March 2, 2012. I want to change it into 02/03/2012. I have tried separating into columns, change the format using customized format etc but it still didn't work. Can you please help? Thanks so much. Do you mean you imported some data? When you right click on the cell that holds the imported data can you change it to Date format. I'm thinking you might have imported text that looks like a date. I tried to convert automatically the date format 7/5/2018 6:57:48 PM in 5-July without succes. I mention that the cells are already completed. I have to enter the date as 20180713 but then I need to calculate the number of days between this future date and the current date (=today()). How do I do that? In the report i have two date format. I want to date format as 27-08-2003 please suggest how to change the date format removing (/) using formula. What do you want to do with the leading digit and hyphen? I have to enter the date 7/18/19 but it will not let me change it like that and I want to keep it like that in general. please help me!! How is the cell currently formatted? Right click the cell choose Format Cells. Which one of those formatting options in the list are highlighted? Choose Date and then the format you want and see if that works for you. How to change date from 01012001 to 01/01/2001??? If you want to simply add "/" to the text string the formula is: =MID(F44,1,2)&"/"&MID(F44,3,2)&"/"&MID(F44,5,4) where the data is in F44. Hi, how can I fix this in excel, when I type a date, ex. July 26, this will appear as July 1, 2026 (1/7/2026). can you help me this issue above? Because of more than 250 rows. When you go to Custom and select Date and choose DD/MM/YYYY in the Type field what does the cell display? Currently on my spreadsheet I have 16-07-2018 DD/MM/YYYY however what I am trying to achieve is 2018-07-16 YYYY/MM/DD? I've tried the format cells and custom but it wont change to the format I am trying to achieve. I have over 10k lines in the spreadsheet. In my excel sheet, I have multiple dates in the format "07/15/2018 8:00" for instance. I changed the date to a serial number and as expected I got a floating number. When I ran the =WEEKDAY function on that cell, I keep getting a return of 1/15/1900. I have tried formatting the column to short date and running that format, but I still got the same result. Please help! I can't find much on the internet about solving this problem. Dear Sir, I am finding MAXIMUM date in F Column and which is having 10000 rows, I have written code like this =MAX(F1:F10000) but is is not working where I tried with G column which is having Price but i am getting maximum price without issues, but in F columns unable to find maximum date. (Note: I think Date is written in Text format ),please provide Macros code on short. I'm having a problem in excel where I have downloaded a file and need to change the date format. It comes out looking like "2018-08-20T19:22:12.559Z" and I simply need it to look like "2018-08-20 19:22:12.559" The 'T' and 'Z' are inhibiting me from reading the file in R and doing what I need to do with it. I could simply change each cell, however I have over 3000 cells to change and that seems tedious. If I understand your question you're asking how to remove two characters from the text string. Where the problem string is in K17 this says to Excel substitute nothing for the "T" and nothing for the "Z". Now, you'll need to copy this down the column and it is only looking for "T" and "Z", but if your data has only a "T" and a "Z" to remove, this won't take a minute to copy down the column. You can of course substitute another letter or letters for the "T" and/or "Z" or something else for the "nothing". Is that a way, for the Excel 2010 to tell me directly (without having to go to Control panel and click Region and Language to check the Date and Times format or look at the bottom right corner of the PC). Eg, if my PC date format :MM/dd/yy , then Excel can give me the result of "MM/dd/yy"
if my PC date format :dd-MMM-yy , then Excel will show me "dd-MMM-yy". I am not quite sure what you trying to express. Can you explain with further details ? How can I copy numbers under conditions, in specific column in another sheets automatically? For example, I have a column containing various numbers in sheet1 and I want positive numbers copied in sheet2 and negative number copy to sheet3 automatically. Where the data is in B59. The returned data will be text. Can someone help me to check days between two dates. I usually use the DATEDIF function. Where "D" tells Excel to return the difference in days. The dates can be cell addresses. I want date to be in 8-12-2018(8-Dec-2018) numeric format and hyphen instead of slash, is it possible? Format the cell as Custom. Right click the cell, select Format Cells then Custom and select the dd-mm-yy formatting from the list. Please note that when you work with dates in Excel, the date format depends on your Windows Regional settings. 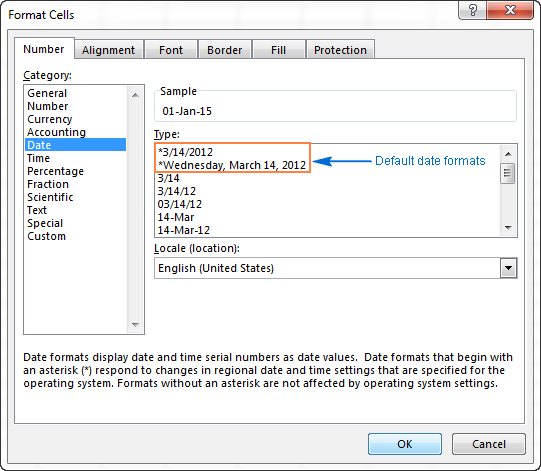 You can either сhange date format for your cells, or modify the default date and time formats in your Excel. 12-10-2018 15:12 Plz Suggest this Format Cells How am change his format cells in DD-MM-YY? 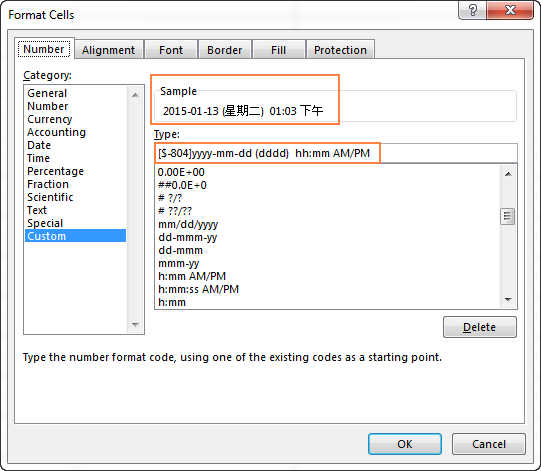 To change the date format right click on the cell, choose Format Cells then choose Custom then from the list choose the dd/mm/yyyy h:mm format. If your list doesn't show this particular format choose the dd/mm/yyyy format and in the field above the list which shows the formats add h:mm to it. I have to capture a lot of till slips for an account recon. I would like to enter, for example 2506 and get out 25/06/2018 or 25 Jun for example. I cannot seem to find how to do that. I tried following your examples using the RIGHT, MID and LEFT values but it wouldn't accept it even if i used it exactly as shown. I'm at a bit of a loss. Nothing on my format options works as the system is reading the input of 250618 or 2506 as a code for a particular date. Please help. Entering each slip date exactly as a date format will be tremendously laborious. I am trying to change date format from 9/13/2018 to 09/15/2018 (mm/dd/yyyy). I am using Excel 2013, Thanks for your help! Right click on the cell containing the data and select Format Cells then Date, then select the 09/15/18 from the list then click OK. I use the "CTRL;" to quickly enter the current date and hit "SPACE" and continue to enter text to provide updates for that date in the same cell. The problem I am having is that regardless of the regional settings for the short date format (in my case 14-Mar-12), it will always use "dd-mm-yyyy" (i.e. the default date type "*") the format I want is "dd-mmm-yy". Is there a way to change the default date type format? If I don't enter any text after and exit the cell it will change the format to the desired one. If you enter any text after it will not change it and it will keep it as dd-mm-yyyy (i.e. 02-04-2018). putting the date in a separate cell is not an option. i try this method and the format did change to the one i keyed in. but when i do month(), the return value is still wrong. is it due to my date values does not have any that is bigger than 12? Could you please describe the problem you are having in more detail? It is not entirely clear what formula you apply exactly and what result you get then. Please specify. I hope you can help. Whenever I type Nov 09, under Date format, it comes out as 01/11/2009. I used to be able to just type in Nov 09 and it comes out as 09-Nov-18. Or Nov 26 when entered is recognized by Excel as 01/11/2026. I was literally bitting off the end of my tail until I found this tutorial. I had trouble with Autofilling the days in date format because I did not know that excel's default dates functions with the one that is set with the computer. I followed the instructions here and changed the format to a preferred one. Thank you so much for this. My calendar created in the academic year has decided to change the year to 2019 starting back to August, which means January now is 2020. How do I correct the year in the Academic year calendar? how i can change following "Oct 1, 2017 4:06:57 AM GMT+05:30 " in excel readable format, i cant filter the value, tried text to columns but failed. How do I format a cell so that when I type in a date all that I have to do is type in the numbers without "/" marks? For example: Typing in "012119" should read as "01/21/19"
Every time I try to format the cell to a date and then type in a date without the slash marks I get some way off date yet every website I type in a date does this automatically. I am trying to change birthdate from yyyymmdd to mm/yyyy in Excel and need help. I have a date format of 20190119 (yyyymmdd), and I would need to change it to 19.01.2019 (dd.mm.yyy), to be able to calculate the difference in days, between to days. Or any other date format, which allows to calculate the difference. I am preparing an AR days overdue template, and need to use columns for days overdue like 01-30 days overdue, 31-60 days overdue etc. pls help me with excel dates. I want my dates to be February 08, 2019 or 02/08/2019. If I type 02/08 or 02/08/19, the result will be august 02, 2019 or 08/02/2019. how could I change the setting? I want to type it as 02/08 & result should be Feb 08, 2019 or 02/08/2019. it converts the text 28/02/2019 from the adjacent cell to 28-Feb-2019 and then I can switch the formatting to text and get the date number 43524. Now I try to paste 07/03/2019 as text and it won't let me, it keeps converting it to a date. It changes it to 7/3/2019. Then the formula won't work on a date, it needs text. I also changed my country to Canadian English and it converted 7/3/2019 to 03/07/2019 and when I change to text it is 43649. I can't paste into a cell and keep it as text ? If I go back to formatt and change it back to text and manually enter 07/03/2019 and enter, the formula correctly displays 7-Mar-2019 and 43535 is the number I get if I change formatting to text which is correct. But I cannot paste into a cell without excel changing it to a date. I only want the text not the date. Now in this second cell will show the date, in however which format you want. open Format cell and if you pick date , you can choose the style , if you pick text you will get the date number. I found out that when you copy and paste the format is copied also which screws things up, so you must past special. How do I change 10/4/2002 to 10042002? Please help. How can I store my own date-time format so it's available in the drop down list? I'd like to have a saved date-time format as an option in the drop down. MS Excel and it's auto-date configuration. Anybody have a way to get around this problem? We have a few million rows of alphanumeric data that ranges from AAA0001 to ZZZ9999. When I export the data into Excel it converts some of these into dates. The work around is to format the column as text before pasting it but I'd like to STOP Excel from auto formatting as a date. Anybody have a way to fix this? In excell if i enter number it is auto changing into date format, how to arrest it ? Can I convert 04.05.2019 to 04/05/2019 i.e. from (.) to (/) separator. Anyhelp would be appreciated.